Majestic Marble & Countertops: Marble and laminate countertops. Brookings, OR. Are you remodeling your kitchen or bath? 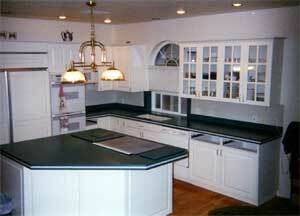 Get the best counter tops and cabinets in the business from Majestic Marble & Countertops. We provide sales and installations of cultured marble, laminate, and solid-surface counter tops, as well as solid maple and oak butcher blocks. Located in Brookings, Majestic Marble & Countertops is locally owned and operated shop has been in business for over 20 years. We perform complete installation services on all the products we sell, and our prices are very competitive. Free estimates are available. For professional sales and installation services in all your countertop and solid-surface needs, contact Majestic Marble & Countertops today!